If you control no monsters in your Main Monster Zones: Special Summon 1 “Sky Striker Ace Token” (Warrior/DARK/Level 1/ATK 0/DEF 0) in Defense Position, which cannot be Tributed, and if you have 3 or more Spells in your GY when this effect resolves, the Token’s ATK/DEF become 1500 instead. 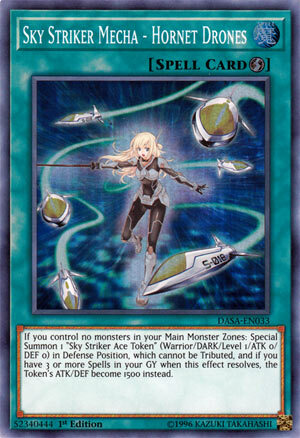 Sky Striker Mecha – Hornet Drones comes in at #9, another card I thought would be a little higher. Quick-Play Spell that gives you a Sky Striker Ace Token. While it can’t be tributed, it can be used for Link and Synchro summoning. If you have three or more spells in the grave when you play this card, the token gains 1500ATK/DEF, which can be handy in certain situations. This one card can Link Summon any of the Sky Striker Ace monsters, and that is why it is one of the best cards of 2018. To be able to get a Link monster that could gain attack or drop your attack by the number of spells in the grave is powerful. Aside from the archetype, it gave several decks a card that was a free link or synchro material, or at the very least a small wall to stop an attack. Players who ran Ghost Reaper in their side deck could run this card in the main deck and have access to the Sky Striker Ace monsters for their own deck, without having to run the archetypes only main deck monster. Having to control no monsters in the main monster zone to activate this card is hardly going to stop this card from being powerful. Any deck can play this card, any deck can make good use of this card. Sky Striker Mecha – Hornet Drones has everything going for it. It’s a Quick Play Spell Card with no cost that lets you summon a token in Defense Position. The token has 0 Atk and 0 Def, it can’t be tributes, and you need to control no monsters to activate the card at all, but all that pales in comparison to its utility. The tokens can be 1500 Atk/Def little beaters or defenders if you want, just make sure to have 3 or more Spells in your grave. I say beaters and defenders plural because you can activate Hornet Drones multiple times per turn. More importantly, the Sky Striker Ace Token can go into any Sky Striker Link Monster, any Synchro Monster, other Link Monsters, etc. for free in any deck. Run the one you’re allowed and be grateful. Score: 5/5 Art: 2/5 Compared to other Sky Striker artwork. I feel we all expected Sky Striker cards to make this list and here we are at number 9, from Dark Saviors we have Sky Striker Mecha – Hornet Drones. Hornet Drones is a simple Quick-Play Spell that can only be activated when you have no monsters in the Main Monster Zones, and you can Special Summon a Sky Striker Ace Token (Warrior/DARK/Level 1/ATK 0/DEF 0) in Defense Position, but if you have 3+ Spells in the GY after this resolves, then the token is 1500/1500 instead. The stats won’t matter cause you are using this to go into Kagari to get back Hornet Drones and use it again. I’d say you would get back Engage with Kagari to search another Hornet Drones, but Hornet Drones is Limited now, so you’ll likely just get back the Hornet Drones to open up a Link-2 or higher play. Hornet Drones is a simple card, but it is a really good starter card for Sky Strikers and it going to one limited the use of Sky Strikers as an engine a bit. Still, you’re playing the Sky Striker engine or the pure deck, you’re putting in that one Hornet Drones to get plays started, it’s stronger than you’d think. Art: 4/5 Run from the robot bees. This is another classic case of how a Deck specific card can be useful in a pinch for any Deck, should it be able to find the room. You get a Token from this card (which makes the Quickplay aspect nice) and you’ll note it can’t be Tributed (but can still be used for other Summons…XYZ/Link/Synchro etc) so advantage can be made from this card easily enough. If you have 3 or more Magic cards in your Graveyard when this effect resolves, which sure could be interrupted, but still, gives your opponent an out to let you have that token, especially if they have a sense on what’s coming, but your token gains 1500 attack and defense. Better than nothing, not game breaking enough to make this card overpowered, while still giving you enough for an attack/defense, if necessary. Versatility is good in cards, and given the greatness of this card for Sky Strikers as well, obviously, I see how this found a way onto the list here. Art: 3.5/5 I like the different vehicles, but the picture is pretty bland, to include the black/grey uniform the woman has.